I’m guilty of giving the same advice to startup founders without providing a transparent rationale. This post is my explanation of why the 15-20% MRR growth number is a reasonably good target for post-Seed/pre-Series A SaaS startups to aim for. Let’s create a hypothetical SaaS startup called SaaSCo with a set of founders who aspire to a fund-raising trajectory like the one in table below. The numbers in this chart are rough estimates of what a fast growing SaaS startup might command in the market, but they aren’t based in any data or surveys. Presuming the founders of SaaSCo raise their target seed round, the founders want to leverage their newfound cash to grow the business to reach the next milestone, the Series A. To reach their target Series A valuation, and holding all other variables constant, the SaaSCo founders must grow their revenues by 3.75x, which is 25⁄6.7. As my colleague Jamie Davidson showed in his analysis of startup follow-on activity, the most successful time for startups to raise a Series A is about 9-10 months after raising a seed. Combining these two data points, the SaaSCo founders deduce they must increase revenues by 3.75x in about 10 months. Backing out the monthly growth rates to achieve those numbers gives us the chart below. To satisfy both the revenue and timing conditions, the SaaSCo founders should aim for a 15%+ monthly growth rate. There are quite a few problems with this analysis. Most importantly, the fund-raising market isn’t completely rational or elastic so the presumption of a constant valuation-to-revenue multiple on SaaSCo is a fallible one. Also, there are lots of deviations in startup paths that are hard to predict, both positive and negative, so planning on constant growth is difficult. Last, we’re not taking into account the varying impacts of burn rate, churn rate and hiring needs demanded on the company by pursuing different monthly growth rates. 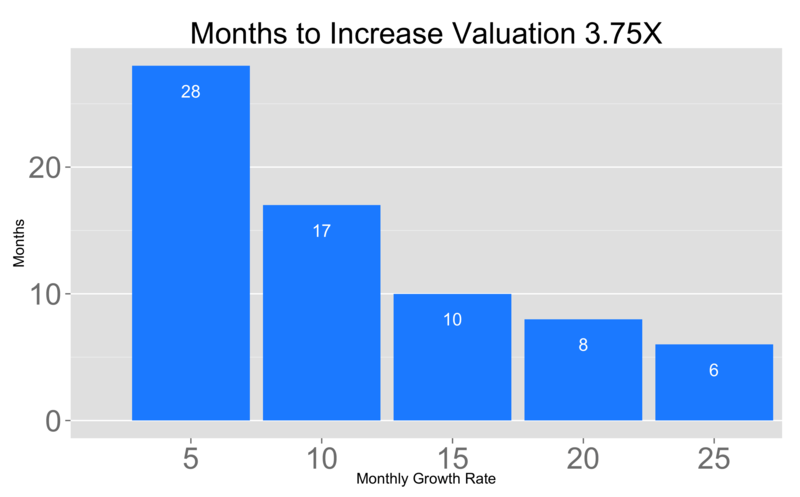 But, this hypothetical models makes the case for 15%+ monthly revenue growth as a good rule of thumb for SaaS companies looking to raise a Series A soon. The same process can be used to create ballpark estimates for post-Series B and C companies as well.